Love this quote and I think that many of us do this and what ends up happening is we spend our precious hours organizing and no scrapbooking gets done. I am going to start with this side of my room - it is to the right as you walk in. As you can see I have to paint some fix its I did a while back...I keep thinking that I am going to hang something there to cover it. This area holds my scrapbooking, sewing and jewelry making items. Plus my TV - which has been great since the DVD player is built into this flat screen. Saved me some space and clutter. This is my alphabet storage drawers. These are three Ikea Fira mini chests that I put together one summer. This was a lot of work since I wanted smooth edges and I had paint made up to match the mayonnaise color of the PB furniture. 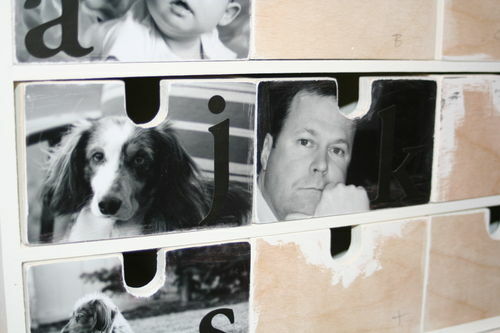 I intended to have pictures on the front of every drawer that represented each letter. But then I noticed that it was looking to busy for me so I covered the rest of the fronts with patterened paper by Crate Paper. These are just black & white photos glued on with PVA glue and then sanded around the edges. Then I used the jumbo sticker letters from American Crafts. 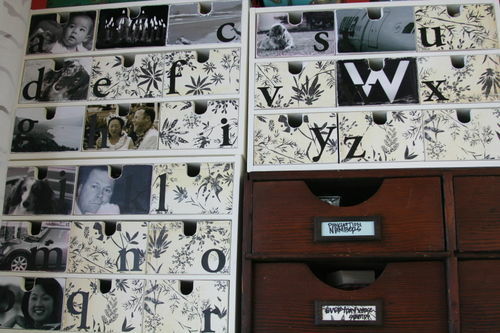 Once the drawers were done I went through all of my alphabet embellishments and alphabet stamps and started sorting into their respective drawers. 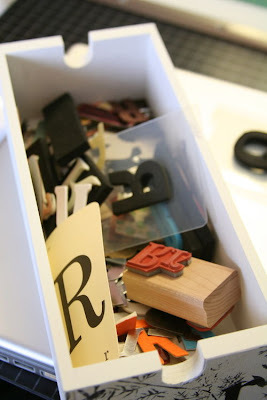 Here is the 'R' drawer. Every letter 'R' that I own is in this drawer. (except letter stickers & mini alpha stamps - coming soon) The tricky part when doing this is when stamps share one wood block for two letters. 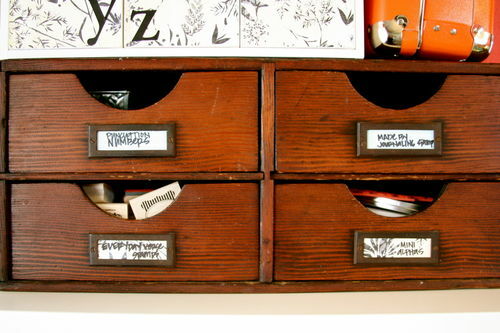 I decided that the stamp would go into the preceeding letter drawer. Meaning if the block had 'R' and 'S', it would go into the 'R' drawer. 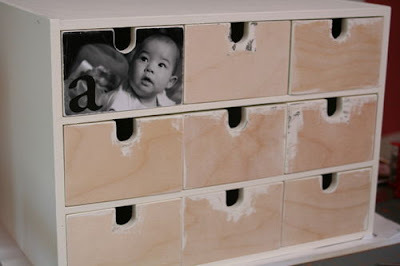 This organization piece has saved not only time but precious space. I am no longer fighting with packaging! [HINT] What I also found is that I actually started using all of this product because I had access to it and could see it all. 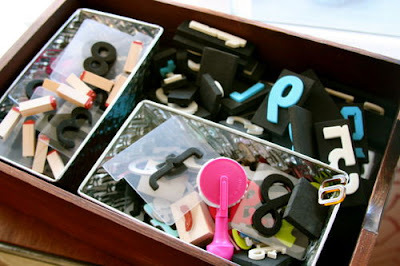 And when I buy new alphabet products it is a BREEZE to put away! The next set of wooden drawers was at an antique store in downtown Camas. I really didn't know what I was going to do with them at the time but for $20 I couldn't pass them up. I knew that they would work some where. They worked prefectly with this set up I had going and for some more stamp storage. [HINT] As you can see, since I splurged on my main pieces I had to find alternative inexpensive pieces for my other storage. It takes longer but I think its more fun this way! First drawer is Puncutation and Numbers - everything including stamps. 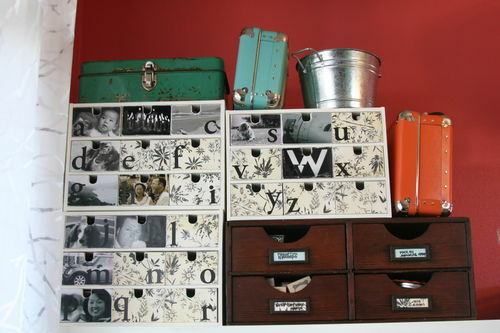 Those tins that are in drawer were from the dollar section at Target. They might be coming out again when they do their gardening theme. I just picked up as many as I could thinking that I could use them for small stuff. 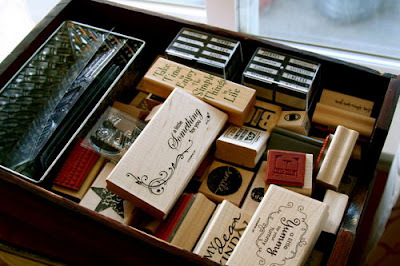 Second drawer is all of my 'made by' and 'journaling' stamps. 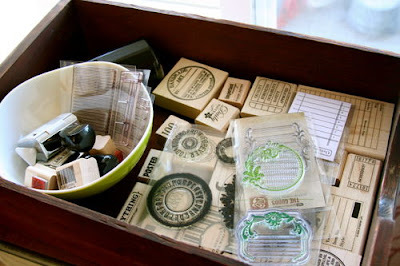 Including arcylics and self inking stamps. Here is green bowl similar to the blue one that I found at Goodwill. Third drawer is my 'everyday saying' stamps. 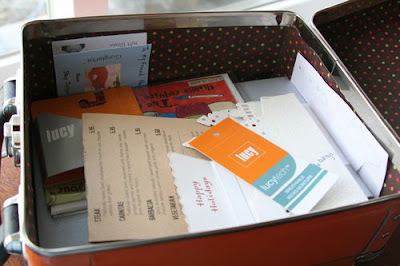 This one is pretty full - but everyday stamps to me are the ones that say 'enjoy', 'smile', 'dream big', etc. Fourth drawer are my mini alphabets. I now have this narrowed down and won't be needing to buy anymore. I have figured out my favorite fonts and gaveaway the ones that I didn't use. 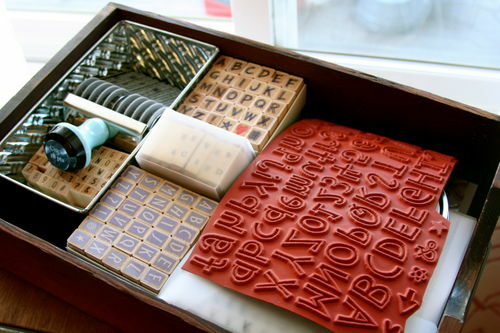 The newest set from Stephanie Ackerman - but I think that will be cut apart and put in the alphabet drawers above since they are big enough. Now the little suitcases are from Paper Source. 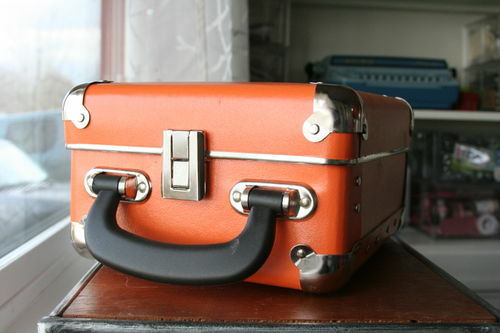 These suitcases hold my personal ephemera. Things that I collect along the way. Receipts, tickets, tags, mail, anything that has meaning to me or tells something about my daily life. The blue one is full - in fact I am scared to open it.